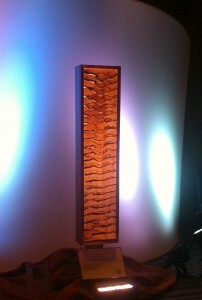 In January Woodleaf Studios donated this wall cabinet to The Methodist Home for Children's annual fundraiser. It is the second year that we have donated a piece to this great cause. The cabinet face is comprised of maple burl from the stump of a tree. The visible pattern is achieved by spreading the 1/4 inch slices of maple apart like a deck of cards. The cabinet is banded with walnut and has several adjustable shelves on the interior. We actually have a similar cabinet in our kitchen that Matthew designed and built of walnut and maple. We use it to store all our supplements and cold remedies etc.. It is functional art as seen below.